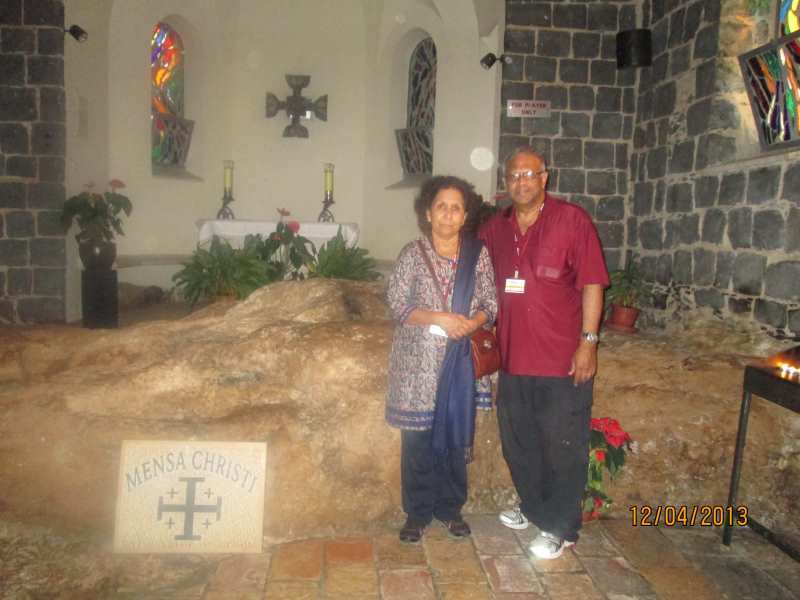 From the Sea of Galilee we proceeded to Tabgha to the Church of St Peter’s primacy. In John 21, Jesus appears to his disciples for the third time after his resurrection on the shores of the Sea of Galilee. The night before, Peter and several other disciples had sailed out on the lake to fish, but caught nothing. In the morning, a man appeared on the shore and called out to them to throw their net on the right side of the boat. Doing so, they caught so many fish they couldn’t drag the net back into the boat. After breakfast, Jesus reinstated Peter (after his three-time denial of Jesus at the crucifixion) with the words “Feed my sheep”. This is the event for which the modern church is named, which is interpreted by the Catholic Church to give the Pope (as the successor of Peter) authority over the worldwide Church. 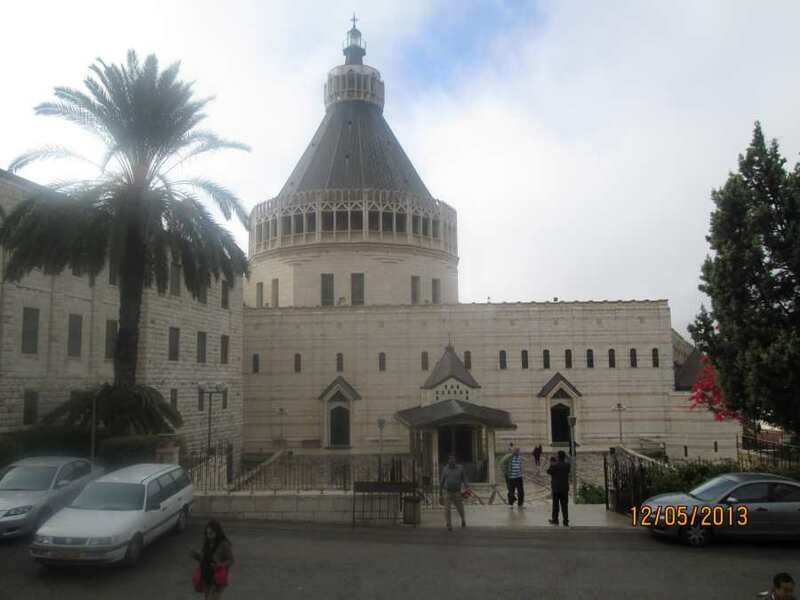 We proceeded from the Tabgha to Nazareth – one of the highlights of the tour because it is the location where the angel Gabriel appeared before Mary to let her know that she was to give birth to a son who had been divinely conceived. 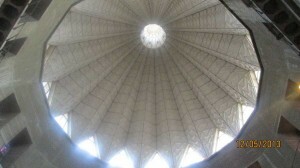 As is the case with just about all of the major biblical sites in the Holy Land, a church is built in the location where tradition believes the site existed. Also, as is the case with some of the sites there are differing opinions as to the precise location. 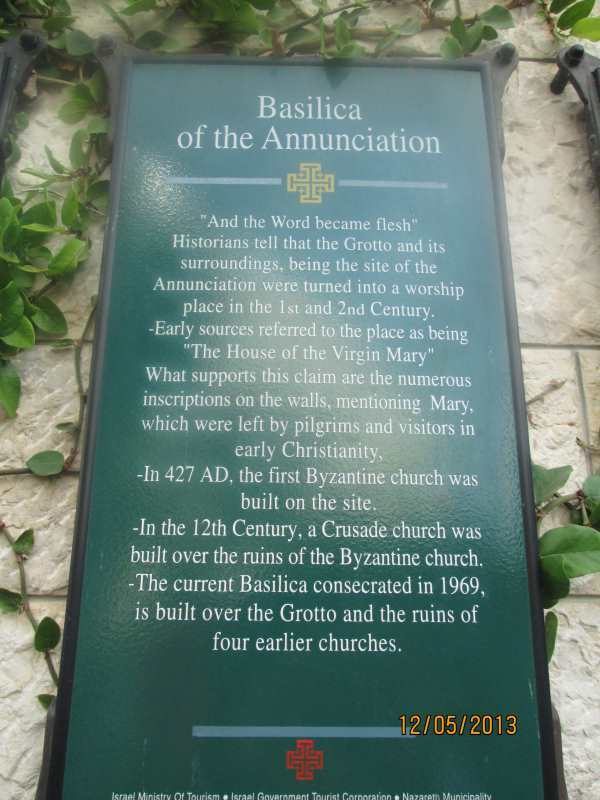 The Church of the Annuciation – sometimes referred to as the Basilica of the Annunciation – was established at the site where, according to Roman Catholic tradition, the Annunciation took place. 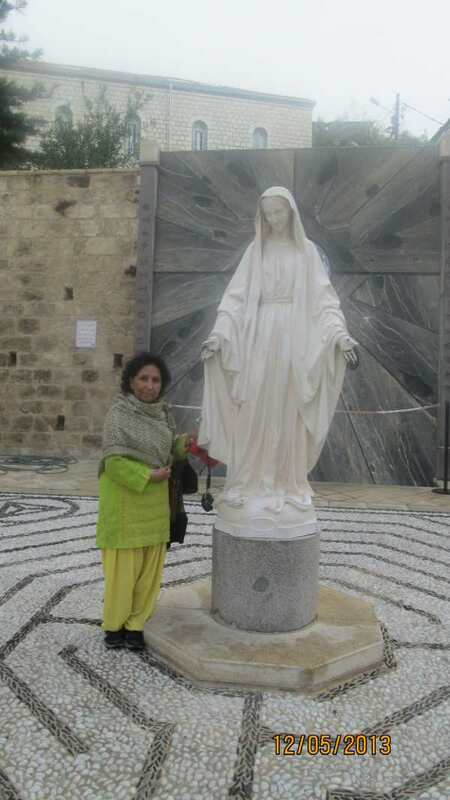 Greek Orthodox tradition, however, believes this occurred while Mary was drawing water from a local spring in Nazareth, and the Greek Orthodox Church of the Annunciation was erected at that alternate site – a site we did not visit on the tour. The current church is a two-story building constructed in 1969 over the site of an earlier Byzantine-era and then Crusader-era church. Inside, the lower level contains the Grotto of the Annunciation, believed to be the remains of the original childhood home of Mary and is considered sacred by many Christians. 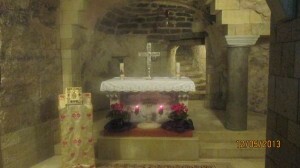 The first shrine was built in the middle of the 4th century, comprising an altar in the cave in which Mary had lived. A larger structure was commissioned by Emperor Constantine I, who had directed his mother, Saint Helena, to found churches commemorating important events in Jesus Christ’s life. Some version of it was known to have still been in existence around 570 AD, but it was destroyed in the 7th century after the Muslim conquest of Palestine. Over the years the church was destroyed and rebuilt several times depending on who was in control of the territory. Franciscan accounts of this period document their expulsion in 1363, their return in 1468 and a massacre of some of their members in 1542. Local Christian families with Franciscan support helped take care of the church during this period. The Franciscans were granted permission to return in 1620, at which time they constructed a small structure to enclose the holy grotto that is venerated as the house of Mary. 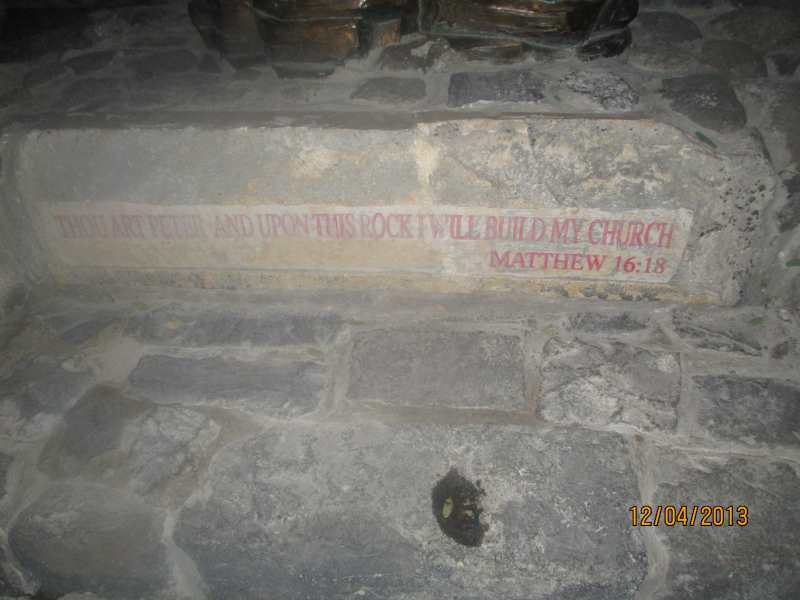 In 1730, a new church was constructed, which became a central gathering place for Nazareth Latin community. The church was enlarged in 1877, and then completely demolished in 1954 to allow for the construction of a new basilica, which was completed in 1969. It remains under the control of the Franciscans and is the largest Christian sanctuary in the Middle East.